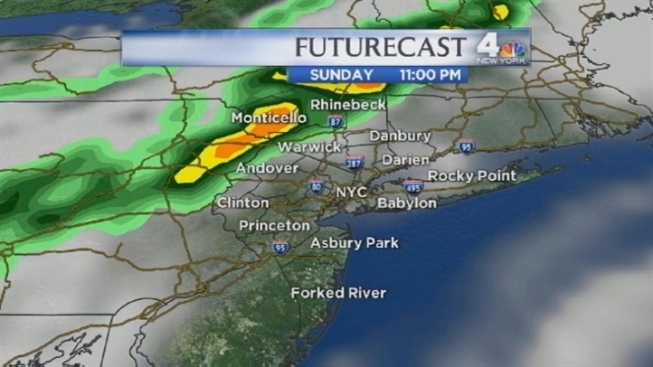 We might see some severe storms in the area after 3 p.m.
Sunday is expected to be another hot and humid day, but an approaching cold front may spark showers and thunderstorms in the late afternoon. There might be some severe storms in the area after 3 p.m. and there is a potential for flooding from torrential downpours as the front moves through tonight. A flash flood watch is in effect through Monday morning for New York City and most of the tri-state area, with the risk of flooding possibly lingering into the Monday morning commute. Expect a high rip current risk at the beach Sunday. Tropical storm Ernesto may reach weak hurricane status over the next couple of days before making landfall in Mexico midweek, and then heading into the Gulf of Mexico. Tropical storm Florence should remain a tropical storm in the East Atlantic. TODAY: Breezy, muggy and warm afternoon and evening showers and storms. TONIGHT: Periods of heavy rain with a few storms, some fog. MONDAY: An Early shower/storm, then Mostly sunny and turning less humid. TUESDAY: Mostly sunny and warm. THURSDAY: Partly sunny with a slight storm chance.